At their core, historic districts celebrate a neighborhood’s history and provide a plan to ensure that the neighborhood’s historic places are preserved and incorporated into the future development of the area. We’ve outlined below some common goals from other historic district efforts, relevant goals established by the 2005 Greater South River City Combined Neighborhood Plan, and the incentives in place to encourage preservation. While we are focusing our efforts on a National Register district at this time, we would love to pursue a Local Historic District, as well, should any neighbors want to move forward with this effort. The Greater South River City (GSRC) Combined Neighborhood planning process began in November 2003 by City Council resolution and was completed in September 2005 as part of the city’s ‘Austin Tomorrow’ Comprehensive Plan. The neighborhood plan (here) outlines eight broad goals for the area. Objective: New single-family construction in residential areas should complement, reflect, and respect the character of the single-family houses in the area. Recommendation A1: The scale and massing of new and remodeled houses should be consistent with the surrounding residences. Objective: Protect historic resources including buildings, bridges, gateways and other structures. Recommendation A3: Seek local landmark designation for individual resources that are eligible and meet intent of the landmark ordinance. 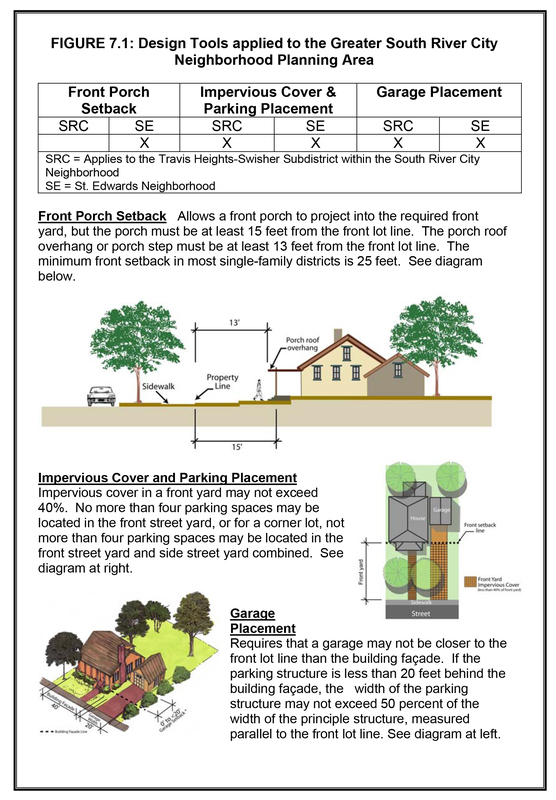 Recommendation A5: Conduct an architectural survey of the South River City planning area to determine which portions of the neighborhood are historically significant. Designate those areas as Local Historic districts. 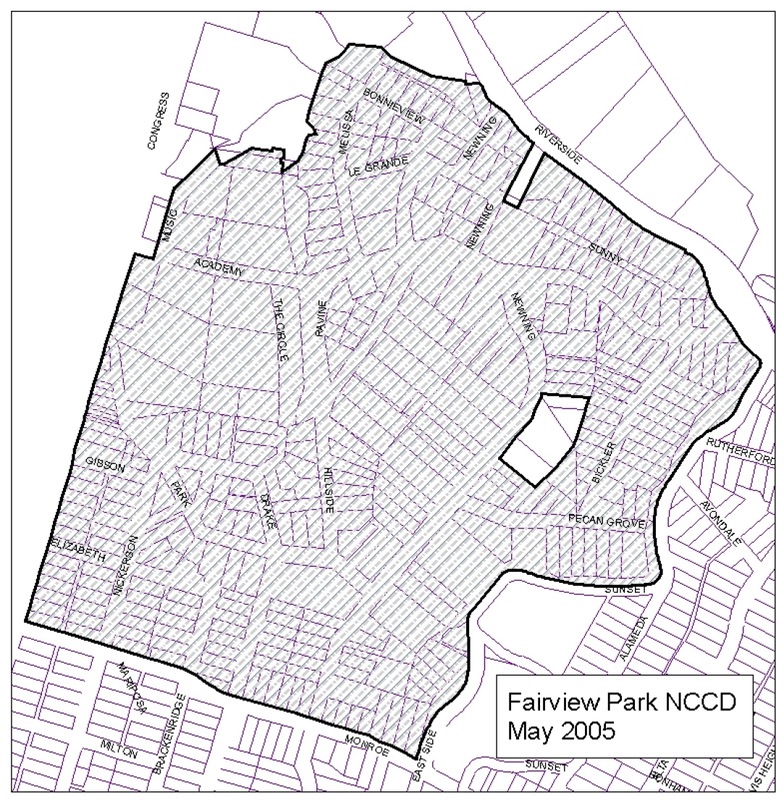 Recommendation A6: Continue to regularly monitor and amend the Fairview Park Neighborhood Conservation Combining District (NCCD) (Figure 7.8) to address unforeseen consequences, changing situations, and appropriate land use changes. Recommendation A7: Pursue voluntary down-zoning of multifamily zoned properties in the Fairview Park NCCD area to single family. Owner-occupants of residential properties that contribute or potentially contribute to a local historic district are eligible for a tax abatement from the City of Austin if they invest in the rehabilitation of their homes. An owner-occupant must reinvest at least 25% of the value of the structure in “qualified rehabilitation expenditures”, with at least 5% of the value of the structure spent on exterior rehabilitation. The Historic Landmark Commission will review rehabilitation proposals and certify the project upon completion, at which time the owner is eligible to receive a City property tax abatement on the added value of the project for 7 years. For example, if the owner of a $100,000 house invests $30,000 in rehabilitation work approved by the Landmark Commission and the value of the property jumped to $150,000 after the completion of the project, the city property tax assessment would be “frozen” at the $100,000 value of the house for seven years.